It is a common misconception that adjusting the inclination of the strut within a Macpherson Strut assembly will alter the king pin inclination (also referred to as the steering axis inclination, SAI or KPI). King pin inclination (also referred to as the steering axis inclination, SAI or KPI) is quite simply the axis about which the wheels steer. Generally, the greater the KPI angle, the more straight line stability the vehicle will have, KPI is also a factor when considering bump steer and scrub radius. Within a Macpherson Strut assembly the KPI is the line between the top mount of the strut (where it meets the chassis) and the lower control arm outer joint. If you want to reduce the amount of KPI at design time you will probably find the strut will clash with the wheel and tire as you can see below on the left. Adding an offset makes no difference to the KPI, but does allow for clearance between the strut and the wheel and tire as you can see below on the right. Yes, that’s correct and the KPI change would also affect the scrub radius. So with an adjustable top hat on a McPherson strut that adjusts camber, would also increase the KPI /SAI if pulled to the centre of the vehicle? 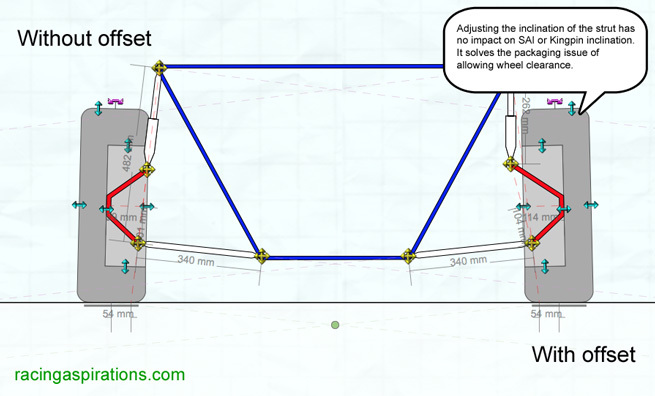 And if the adjustment is fore and aft it would adjust the caster angle but not the KPI?